These are all great Days to be proud to be an American and show your red, white and blue. 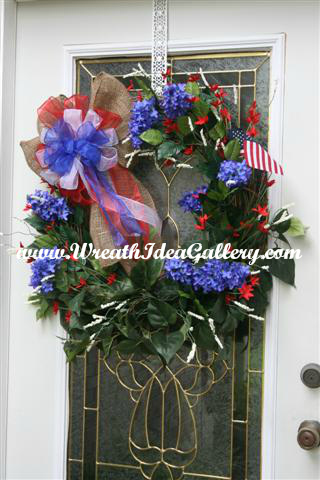 What better way to show your American Pride than on your front door with a made in America wreath. 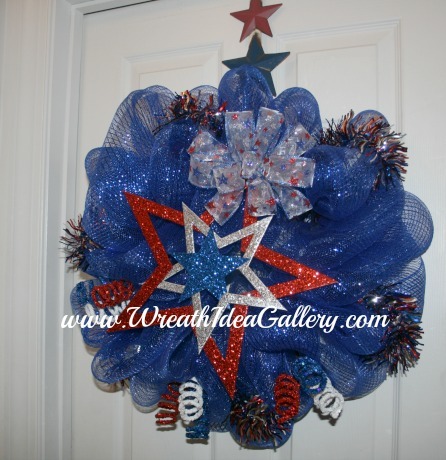 Aside from the red, white, and blue there are a few options to decorate your wreath. 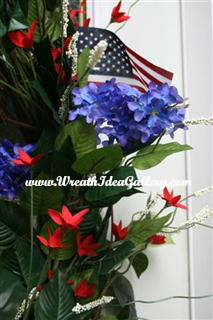 This is a Patriotic Wreath, I made and it almost looks like a flower arrangement, flowers are a passion of mine so I do use them in many of my wreaths. 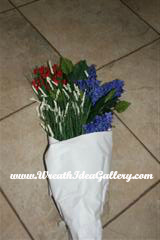 Here I chose three different kinds of flowers to represent the red, white and the blue. When I was picking out the flowers I wanted flowers that kinda looked like fireworks. 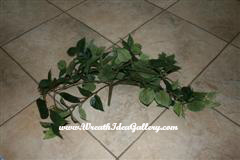 I started with a large grapevine wreath and a large sprig of philodendron greenery. I attached the greenery to the bottom of the grapevine in the center and formed them up each side, poking the leaves and branches in the grapevine to hold in place. Next I made the bow. This bow is four tiers. 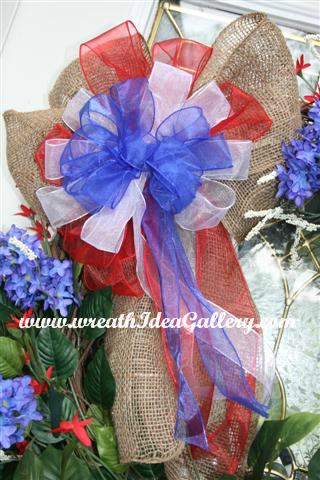 The base is made of burlap, then the next three layers red, white and blue all on top of each other for an explosion of ribbon color. I attached this to the top right to balance the weight of more flowers on the left. I put three of my five blue flowers on the left two on the right. Then I filled in with the red and white flowers as needed. 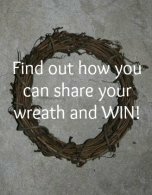 The flowers are all just stuck and woven into the grapevine wreath using a pipe cleaner when needed to hold some in place. No glue, so when necessary if it needs a little rearranging, easy to do. As a finishing touch I added a small flag on the side. Red, White and Blue American spirit. 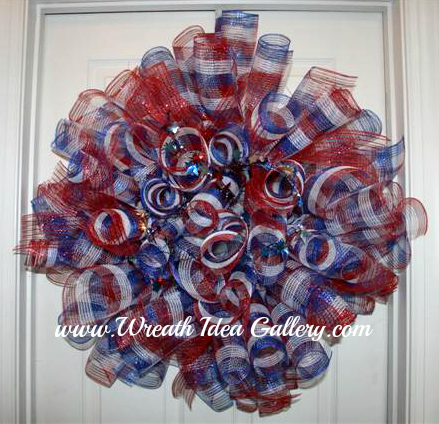 This wreath is made from a lot of material squares. This fabric punch wreath is time consuming, requires a little patience but is so beautiful when complete. Because this is made of material it would be designed to hang indoors, maybe in an entry or over a fireplace, or even in front of a mirror. I have it hanging on the inside of my front door so we can enjoy it from our living room. Another version of the red, white & blue. 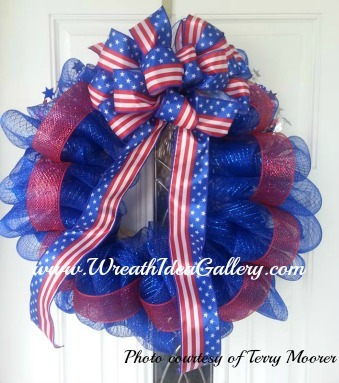 This will sparkle on your door for the 4th of July or patriotic holiday. 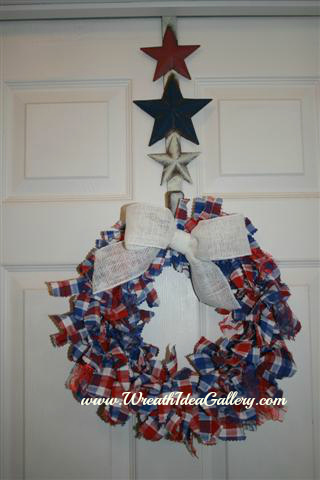 Left over material from the Punch fabric wreath I made this easy rag wreath. 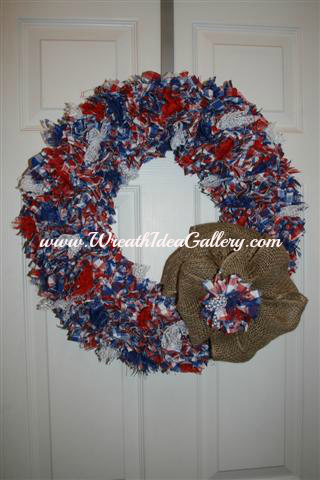 Patriotic ~ Red, White & Blue deco mesh wreath.